From left to right: Sean Delaney, Alan Skeritt, David Donovan, Action Chimneys technicians; Sean McBride, OFTEC Ireland; Peter O’Byrne, Managing Director, Action Chimneys; Patrick Reynolds, Metac Trainer; David Breslin, Leonard O’Reilly, Joe McKenna, Action Chimneys technicians. 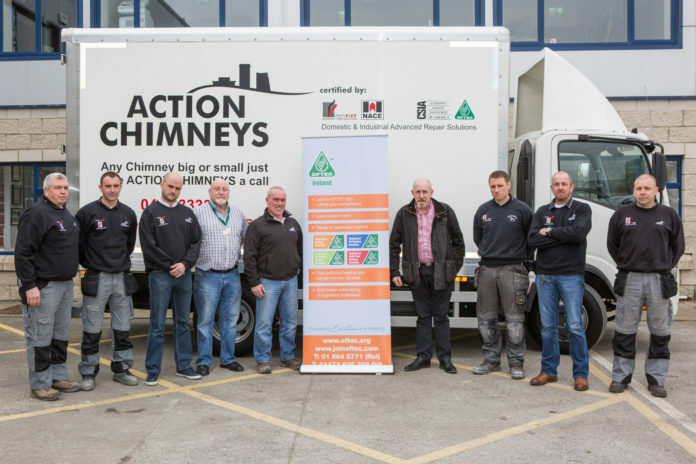 OFTEC, the leading representative of the domestic oil heating and solid fuel industry in Ireland, has awarded Action Chimneys technicians with OFTEC registration. Action Chimneys, specialists in chimney repair and relining, participated in OFTEC’s solid fuel training course to receive the high-commended certification. The OFTEC course has enabled eight Action Chimneys technicians to gain full OFTEC registration status, providing credibility within the industry. This has a positive impact on the overall quality of installation work and allows them to deliver expert workmanship on solid fuel in homes across Ireland. As OFTEC has expanded into the solid fuel sector, it has become the top representative from which to gain specialist knowledge regarding solid fuel appliance installation and servicing. The course provided Action Chimney technicians with the highest possible standard of training and full knowledge of industry best practice in the installation, commission and servicing of solid fuel appliances. OFTEC’s network of approved training and assessment centres continually offer the OFTEC approved course on solid fuel training. The five-day course focuses on the installation, commission and servicing of solid fuel appliances such as roomheaters, which are not connected to a central heating system. The course covers a variety of areas, including health and safety, regional legislation and requirements, safe electrical isolation and expert knowledge of solid fuel storage. Commenting on the success of course, David Blevings, OFTEC Ireland Manager, said: “We are delighted with the impact our training course has had on the technicians of Action Chimneys. Having such a large number of eight technicians becoming fully OFTEC registered is a huge success, both for Action Chimneys and the wider industry. “Action Chimney’s desire to undertake the OFTEC solid fuel training course demonstrates the level of commitment throughout the industry to deliver the best quality service to clients, learning from OFTEC’s expertise and professional advice”. Peter O’Byrne, Founder and Managing Director of Action Chimneys recognised the trusted credentials of the certification and the confidence for the end consumer in choosing an OFTEC registered installer, “Our technicians welcomed the depth and range of information provided within the OFTEC course, including the application of best practice guidelines in the installation, commissioning and servicing of solid fuel appliances. “Action Chimneys is proud to adopt the high standards demanded by OFTEC as we continue to deliver high quality and trustworthy service to our residential and commercial clients”.